I started collecting James Bond books at the age of 14 back in 1990. I did miss the opportunity to see LICENCE TO KILL at the cinema and had to wait another five years until GOLDENEYE was released. During that time most you fans would have given up on James Bond if they had to wait as long as I did. Since James Bond is not a Swedish character and Ian Fleming is no longer a household name here I have always felt like a goof or nerd for enjoying the books as much as I do. When the subject of my collection has come up I still find it troublesome to talk about. 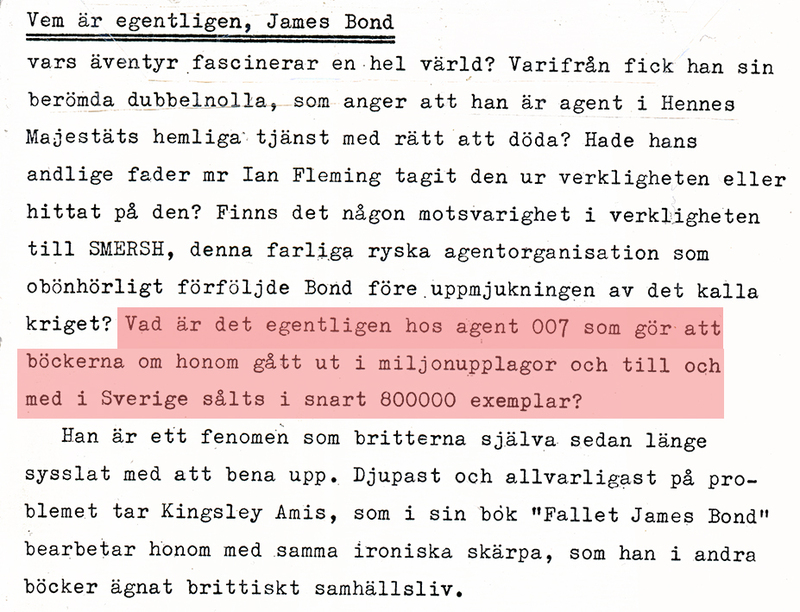 I get the feeling that Swedes just don't understand how big Ian Fleming was during his last years alive. But going through my collection the other day I noticed something that I have been longing to find for decades. It was on the backside of the Swedish edition of Kingsley Amis THE JAMES BOND DOSSIER (released is Sweden under the name "The Case James Bond") On the back of that book it says the following very interesting sentence. "What is it with Agent 007 that makes the books about him being sold by the millions and even in Sweden sold in 800 000 copies soon". Now wee need to take a few things under consideration here. 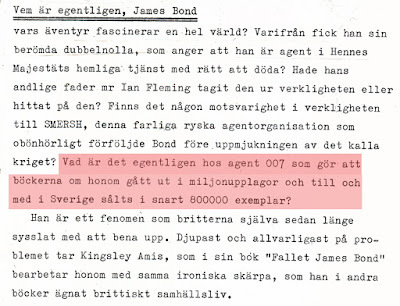 THE JAMES BOND DOSSIER was released in Sweden in 1965 (same year as in the UK). According to this website the population in Sweden was 7 777 000 in 1965 (look at the population figures twice). To be a British spy writer in the UK selling 800 000 copies as early as in 1965 must be considered an fantastic achievement back then. The books were to be released many times after 1965 by the Swedish publishers Albert Bonniers Förlag. 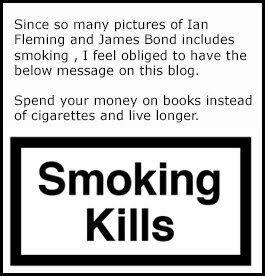 My guess is that Ian Fleming have managed to sell more then one million copies in Sweden alone. And rumour has it that the books will soon be released in Sweden again. This time by publisher Modernista. So from this day forward I will never feel ashamed of my collection and hobby. Ian Fleming is clearly a household name with in the elder generation of Sweden. PS. Let me just mention that according to an article on IanFleming.com Swedish publishers Albert Bonniers Förlag was quick on their heels. Sweden was the third country in the world (after UK and US) to publish Casino Royale back in 1955. 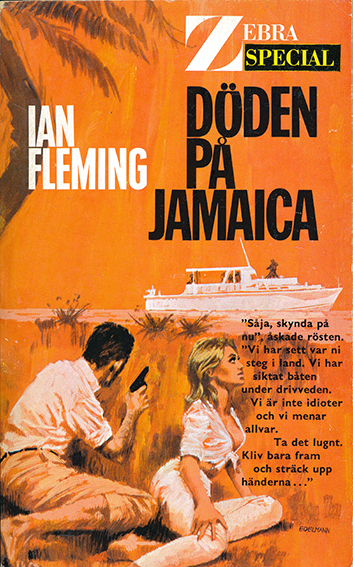 A wonderful cover design for DR. NO titled DEATH IN JAMAICA in Sweden. This edition released in 1965. Swedish edition of THE JAMES BOND DOSSIER. Text in Swedish regarding the 800 000 sold copies.